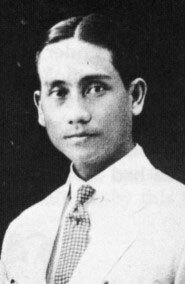 Huseng Batute was one of the many pen names used by Jose Corazon de Jesus, born Jose Cecilio Ramon Augusto Pangilinan de Jesus on November 22, 1894. A prolific writer and lyricist, he also used the following pseudonyms: Corazon, Huseng Katuwa, Anastacio Salagubang, Sundalong Lasing, Pepito Matimtiman, Viterbi, Ilaw, Paruparong Asul, and Bayaning May Sugat. He was born in Santa Cruz, Manila, to Vicente de Jesus of Santa Maria, Bulacan, and Susana Pangilinan of Pampanga, but he grew up in his father’s hometown. Although he studied law at the Escuela de Derecho, he was an artist at heart, so he also studied humanities, Italian opera, and piano at the University of the Philippines. He did not take the bar exam, and did not pursue law as a profession. Instead he became a writer for a newspaper. In 1920, he began to write for the column Buhay Maynila (Manila Life) in Taliba, where he was able to produce about 4,000 poems, using the pseudonym Huseng Batute. But he was only 17 when he wrote his first poem Pangungulila (Sorrow). His patriotism and social consciousness emerged in his literary works. His poetry is melodic and poignant, and he is considered a prominent literary figure among the older generation of writers. He also gained popularity for his balagtasan (lyrical joust) with his foremost opponent, Florentino Collantes. He often defeated Collantes, making him Hari ng Balagtasan (King of the Balagtasan). De Jesus also wrote lyrics for musical compositions, especially those by Nicanor Abelardo, as well as such as songs as Constancio de Guzman’s Bayan Ko, Francisco Santiago’s Pakiusap, Gerardo Enriquez’s Pusong Wasak, C. Ortanez’s Luha ni Juan de la Cruz (Tears of Juan de la Cruz), and Crispino Reyes’s Arimundingmunding, among others. Quirino, Carlos (1995). Who’s who in Philippine history. Makati: Tahanan Books. Tiongson, Nicanor (Ed.). (1994). CCP Encyclopedia of Philippine Art (Vol. 9: Philippine literature). Manila: Cultural Center of the Philippines.